Usually, I start the process with a stream of consciousness narrative trying to describe a particular moment in my story. It might be the opening moment. It might be one of a couple of different moments I’m trying to reconcile in my head. I try to focus on concrete details as much as possible. What was I wearing? Which room was I in? What could I smell in the house? What was the weather like in the park? What was the color or pattern on the picnic blanket? Who was with me? What did their voice sound like? How did the move their hands or body? What was their facial expression? As I’m working through these details, I also try to write out what I was thinking as this moment was playing out. I try to resist imposing the sense I’ve made of the situation since it happened. That’s important, but I find it only gets in the way as an early part of the drafting process. I try to be disciplined about the distinction between what I was thinking at the time, and how I’ve come to process it since then. If the processing came later, I try to leave it out of this part of the process. But sometimes I end up doing some of the emotional processing of the situation as I’m writing the draft. When that happens—and to be honest, it’s one of the more exciting parts of the process for me—I’ll make some note about it in parentheses or in another document that I’ll I can return to later. It takes a lot of discipline for me to stay focused on the moment itself. So I keep writing until I’ve described the moment as thoroughly as possible. At the risk of sounding trite, what I realized during that process was the value of the PROCESS. Sure, I make digital stories because I want them to exist in the world. I want to be able to share them. I want people to see them and maybe be affected by them. But I came to realize that the process of processing my stories was probably even more valuable to me. I know, I know. You might recoil a bit at the notion of storytelling as therapy or navel-gazing or solipsism. You wouldn’t be the only one. I’m sympathetic to those critiques. That’s not necessarily why all storytellers create stories. It’s not even the only reason I create stories. Most often, the value of the process—for me—is to help make sense of something. Maybe something emotional. But it might also be something I’m just curious about. For instance, I’ve been working for years on a story (or some stories) about how cameras take pictures. Another one of my ongoing projects is about digitally scanning a book. And I’ve helped people with amazing stories with all sorts of purposes: explaining an obsession with conspiracy theories; trying to describe complicated scientific research to non-scientific audiences; trying to recreate the meditative nature of rowing. Stories don’t have to be emotionally fraught. What they do have to be is concrete. Another potential bonus of drafting long is that you improve your chances of finding ANOTHER story you might want to tell. 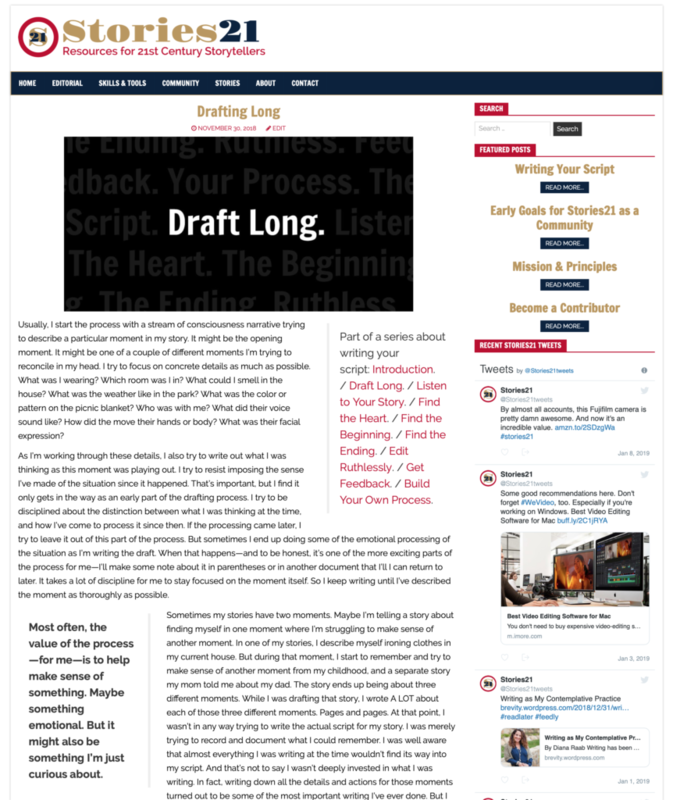 Creating a long draft is just one stage of the drafting process. I would love to hear your own strategies for getting started with your initial draft. What are you biggest challenges? What have you found works best for you? Has anyone ever given you any really bad advice? Feel free to share in the comments below.